Viktor E. Frankl is Professor of Neurology and Psychiatry at the University of Vienna Medical School and Distinguished Professor of Logotherapy at the US International University. He is the founder of what has come to be called the Third Viennese School of Psychotherapy (after Freud's psychoanalysis and Adler's individual psychology)--the school of logotherapy. 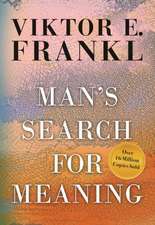 Born in 1905, Dr. Frankl received the degrees of Doctor of Medicine and Doctor of Philosophy from the University of Vienna. During World War II he spent three years at Auschwitz, Dachau and other concentration camps. De (autor) Viktor E. Frankl et al. De (autor) Joseph B. Fabry et al.